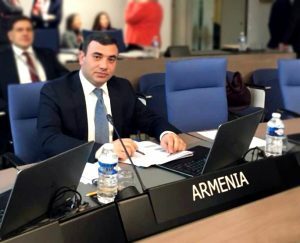 YEREVAN, Armenia— On February 6, American University of Armenia (AUA) alumnus Emil Babayan was appointed Adviser to Artsakh President Bako Sahakyan. Prior to his appointment, Mr. Babayan has served as the Deputy Prosecutor General of the Republic of Armenia since 2013. After serving in the RA Armed Forces, Mr. Babayan graduated from the AUA LL.M program in 2001 and became a researcher at AUA the following year. In 2008, he was awarded the Distinguished Alumni Award by the Department of Law of the College of Humanities & Social Sciences (CHSS). He also received a Master’s degree in International Law from the Leiden University (Netherlands), specializing in international criminal law. From 2008 to 2012, he served as Deputy Minister of Justice and has also been the Deputy Representative of the Republic of Armenia to the European Court of Human Rights (ECHR). In addition, Mr. Babayan has served as Chairman of the Commission for Ethics of High-ranking Officials from 2012 to 2013. In light of his new role in the Artsakh government, Mr. Babayan will now represent the Republic of Artsakh in the European Court of Human Rights, as well as various other international organizations. As Legal Adviser to the President, his tasks include ensuring that Artsakh is represented and included in discussions among international organizations and courts where the Republic’s vital interest are concerned. “While formal recognition is, of course, important for current international politics, we believe that when there is an issue of humanitarian law and security of the civilian population, we must adopt a flexible approach and put the interest of basic human rights ahead of many international law principles,” Mr. Babayan notes. As the distinguished guest speaker at AUA’s 2010 Commencement ceremony, he emphasized that preserving a free and just environment in the country was a responsibility which belongs to all the University’s graduates. In addition to his professional accomplishments, Mr. Babayan is an engaged alumnus and active member of AUA’s faculty. As a lecturer at the University since 2003, Mr. Babayan continues to bring his professional experience and practical knowledge of the law and legal systems to the classroom by teaching several courses including on the Nagorno-Karabakh conflict, genocide in international law, and the European Convention on Human Rights. He encourages all students and graduates of AUA to see their future within the context of Armenia’s future. From his time as an educator, he notes that there is a striking difference between his generation and current AUA students. “To be honest, I do not know if this is a good or bad thing, but when I was a student, my generation had more dreams than plans. Meanwhile, current students have more plans than dreams. Perhaps, in this pragmatic 21st century it is more convenient to live and succeed according to a carefully charted agenda. However, we only plan for that which is achievable. But, when we dream, we dream about that which we do not know how to achieve yet. I wish [my generation] had more plans then and that current students had more dreams now. Only by following our dreams can we achieve things which are impossible to foresee. A dream is a very powerful incentive to develop your skills and accumulate new knowledge,” he concludes. The AUA community joins in congratulating Mr. Babayan on his new appointment.